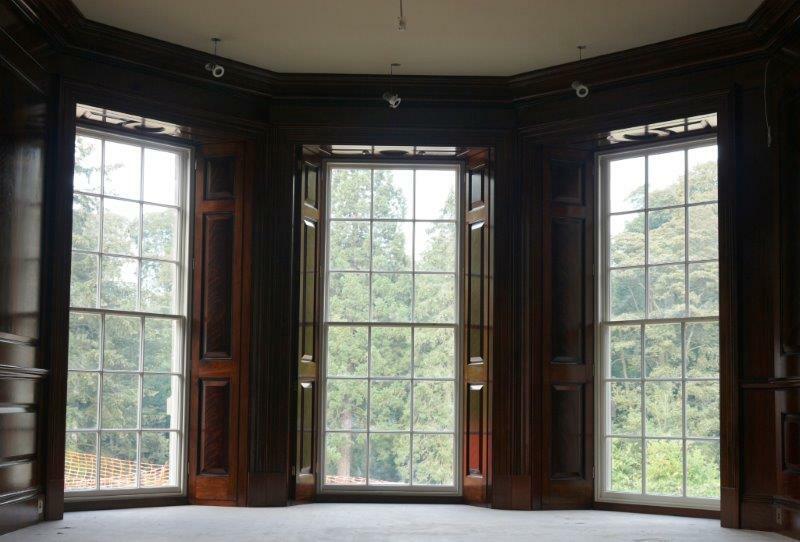 SPS Timber Windows for their orangery, French doors and sash windows project. Houghtons of York Ltd is a family run business which employs highly skilled craftspeople and uses traditional methods and materials to produce a broad range of bespoke commissioned work. It has won the prestigious BWF Technical Excellence Award for an outstanding large-scale renovation of a late eighteenth century Grade II listed home in North Yorkshire. This involved the removal of all elements of a destructive 1970s refurbishment and the reinstatement of many period features throughout the original building. 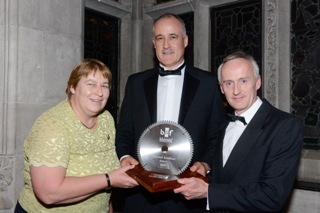 (Roger & Susan Silk of Houghtons (r and l) collect the award). Houghton of York’s work included creating external doors, traditional sash windows with either internal splayed panelled linings or traditional multi-leaf shutters, internal mahogany doors, painted panelled rooms, and a polished mahogany library with flame veneer panelling and ebonised wood details. To the main house staircase, it created a cross banded continuous handrail with ramps and twists plus a wreath at its base. In addition, clever and discreet adaptations to the joinery fixtures allowed the home owner, a wealthy businessperson, to hide away an array of high tech services, sound systems, data cabling, CCTV, home cinema and other equipment behind traditional period façades. This meant creating fittings such as removable cupboards and shelving systems that dismantle and wheel out to give access to the equipment and wiring. 2013’s winning entry was from Oakwrights Bath Ltd for its transformation of a building in central London into a spiritual centre for the Self-Realization Fellowship. 2012’s entry was won by Icklesham Joinery for its outstanding renovation of the Robert Adam designed RSA House off the Strand in London. They were tasked with supplying the specialist joinery items for the House’s refurbishment including air conditioning unit housings, fire-rated doorsets and shutters, roof lantern mouldings, oak wall panelling, oak speaker enclosure units, cloakroom storage and the double entrance doors into the Great Room which also had to incorporate a hidden projector. See more about this project. 2011’s joint winners were JELD-WEN UK Ltd and Howdens Joinery for its Howdens Burford door project. 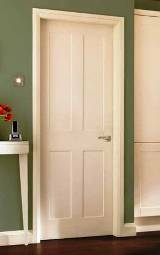 The JELD-WEN Howdens Burford door was launched earlier this year as a special moulded door exclusively designed to compliment Howdens Joinery’s best selling kitchen range, and to provide a family of kitchen frontals and matching joinery doors. See more about this project. 2010’s winner was Welland Timber Products Ltd for its role in the extraordinary restoration of Horace Walpole’s Villa in Strawberry Hill, Twickenham.